Not the best picture, but you get the idea. Time to let all of these goodies go to their new home. It looks like a lot but I will admit that I had expected to get even more done. I have a few things in the works but for now this is what Mimi's closet has to offer.Not so sure why that one pink daygown in the back looks so rumpled. Its not in real life. I will admit it will be sad to let them go but it will all be worth it to see them on their much awaited recipient. What are you sewing faithful reader? And thanks everyone for the good wishes for our sick kitty. He is home now and happy to be here. He doesn't get far from my side. We will cherish the days he has left with us however many they are. It is a wonderful grouping. I know you will be delighted to see them on the baby. What a treasure trove of beautiful baby creations! What a lucky little one to be receiving them! You are absolutely one of the most talented sewist I have run across, ever. What a beautiful collection--and what a lucky baby! I wish I could touch and see each of them. Martha....they are all so gorgeous!!!! That is one lucky baby!!!! I am finishing Wee Care gowns and then I'll be making some more little boy rompers. Oh my goodness!!! What an exquisite layette for the sweet baby!! She is going to be just adorable in all these Mimi creations!!! What a treasure. Unfortunately, I am not sewing!!! Trying to recover from being on vacation for a week and computer woes on top of that!!! I just took an audible breath in--I love seeing all those pretty things for the baby! What wonderful gifts that will be treasured. Just Lovely !!! Grandmother's handmades are alway such a special keepsake. I just posted a couple of pictures of my latest projects if you would like to take a peek. Wish I still had a teeny grandbaby to stitch for. Mine are 9 and 13, and no longer care for Nanny's fashions. Oh well !!! I do enjoy seeing my customers in the sweet clothes I make for them. There is nothing more wonderful than seeing the entire collection together! I love what you have done. Will you present them to your daughter at a shower?? A gorgeous little wardrobe because each stitch is filled with so much love. A very blessed babe. I just finished making a little pillowcase dress, but really want so much to play with some batiste and lace before my surgery -- just one more time for luck! 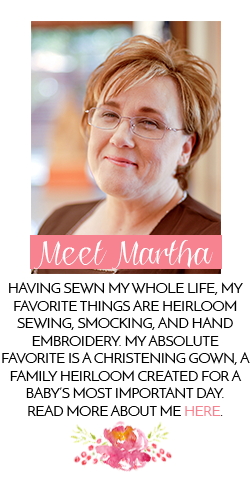 Very pretty, Martha! Can't wait to see a pic of the new baby girl! Wow they are so beautiful. Lucky recepient. That's a whole lot of love on that bed. I'm can't wait to see Evamarie in every outfit. We want to see photos of that baby girl in every outfit. Incredible!!! OMGoodness! You have been a busy Mimi! I can't wait to see pics of a sweet baby girl wearing your gorgeous creations! I have been working on drafting and test-stitching newly drafted patterns this week! Lots of fun to just spend time in the sewing room letting the creative juices flow! Martha, such a precious layette !! I'm still getting back in the groove after Sewing in the Sierra. did get started again on the quillows for my friend's 3 DGDs, pieced the tops months ago but the weather finally decided it's Summer and the polar fleece backing is a little warm to stitch on. Oh my. I had to enlarge the pic so I could stare at the whole layette. This is all just so unreal. Every item is perfect and precious. I pray this little one arrives safely and in beautiful health. Martha, what a beautiful collection. Does your daughter realize how lucky she is? I am sure she does! That is going to be the best dressed child...ever!! I am finishing up projects from last week's school at Children's Corner. Then, I need to whip up some quick 4th of July outfits and pillows for my screened in porch. Just beautiful and love-filled-lovely. Best wishes!